Get the Animals & Nature News widget and many other great free widgets at Widgetbox! 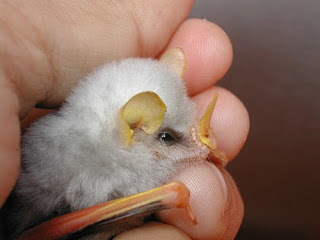 The Honduran White Bat, also known as Honduran Ghost Bat, is one of only 2 types of white bats. Found in lowland rain forests of Honduras, Western Panama, Eastern Costa Rica and Northern Nicaragua, this tiny thing is only 1-2 inches and weighs less than 1 ounce. They eat fruit, such as figs, and other vegetation. Little research has yet been published about this bat, but an interesting fact about them is that they make tent-like shelters from the leaves of the heliconia plant (which has the exotic flower shown to the right). The bats chew along the top of the leaf to break the fibers, causing the leaf to collapse in a tent shape, where the bats huddle together in groups (or colonies) of 1 to 12, protected from rain and sun. Males and females roost together until babies are born, at which time the male leaves the nest (tent). Honduran white bats are listed as "near threatened species" because they are declining in number quickly, as their habitat is being destroyed by humans, while our populations increase.